The Remote Cash Control concept is about monitoring and controlling a geographically dispersed Cash Smart Safes population installed at merchant retail outlets, intending to safely store the cash collected during the daily commercial activities. The local app installed on each Cash Smart Safes, aiming as a simple, secure and smart interface to users. CashCluster is incorporating a synchronization agent towards the central CMN System. A suite of cloud-based monitoring, control and data analytics apps, available via the web 24X7. A real-time supervisory control monitoring workstation, based on a thematic geomap populated with all installed Cash Smart Safes. Android mobile app connecting to CMN System, to follow your smart safes fleet on the go. One-click view of your smarft safes status, drilling down to specific devices at will. IcM is a sophisticated Incident Management system optimized for multiple stakeholder RCC systems. Large RCC fleets now are supported by Help Desks with Incident Response Teams equipped with IcM, a strong and versatile Incident Management System, ensuring continuous health monitoring, critical events watch and communication drops early detection. 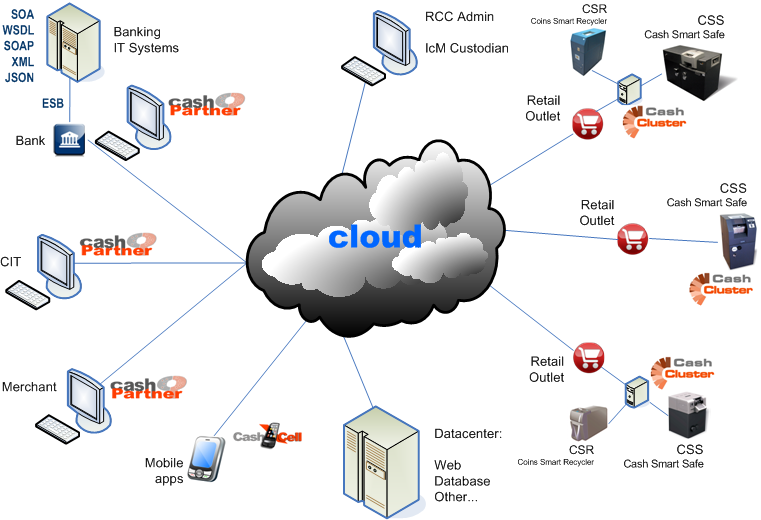 The Cash Monitor Network (CMN) System is the center of a "star" formed network, serving as a centralized cloud-based SCADA server. A dedicated Cash Smart Safes (CSS) network monitoring processes control is running in the CMN server, collecting near real-time CSS information across the whole network via secure web connections. Compelling events are generating notifications that are relayed to the RCC system stakeholders, re: Merchant, Bank and Armored Courier Servuce (CIT).